But missing are the free-fall parachutists, wingsuiters, weather balloons and hobby rockets who can all carry transponders of one form or another. But you try getting the little green men from Alpha Centauri to comply with FLARM by putting the right transponder on their flying saucer. And what’s a “static object”? There’s no such thing as antigravity, so the only kind of static object in the air is going to be a very tall building or a tethered balloon. You’d think that the existence of such a structure would be relevant to any aerial collision avoidance system, wouldn’t you? Its not the telephone poles that matter; it’s the wires between them. In any case, both LK8000 and XCSoar have implemented this FLARM protocol, so all the Air-Where folks needed to do to achieve something amazing was to program in the relevant text strings and then the whole dynamic mapping thing works automatically on the display. 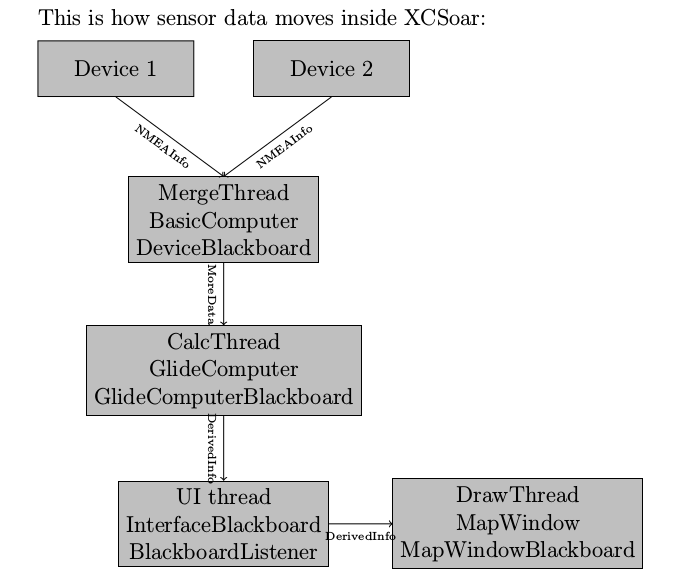 Meanwhile, I have my temperature/humidity sensors, barometer and accelerometer that I’d like to insert into the XCSoar display system so it stands a chance of showing up on a screen I’m actually going to see. I’ve learnt in practice that I’m never going to see that little OLED display I’ve lavished so much time programming up. * Pressure sensor high resolution. Their main selling point is that it gets accurate air-speed “thanks to our patent-pending automatic calibration system“. I can’t find their particular pending patent, but it is possible that in their application for a government backed monopoly of this obvious software-implemented idea, their professional paid-for patent attorneys overlooked US Patent application 20110238373 A1 filed in 2010 by staff at NASA. If the XCSoar and LK800 software upgraded themselves to the GPLv3 license, we could explicitly do away with this sort of nonsense, waste of money and waste of time. This idea was soon abandoned… By integrating an accelerometer, the vario becomes more responsive, but we found a problem. 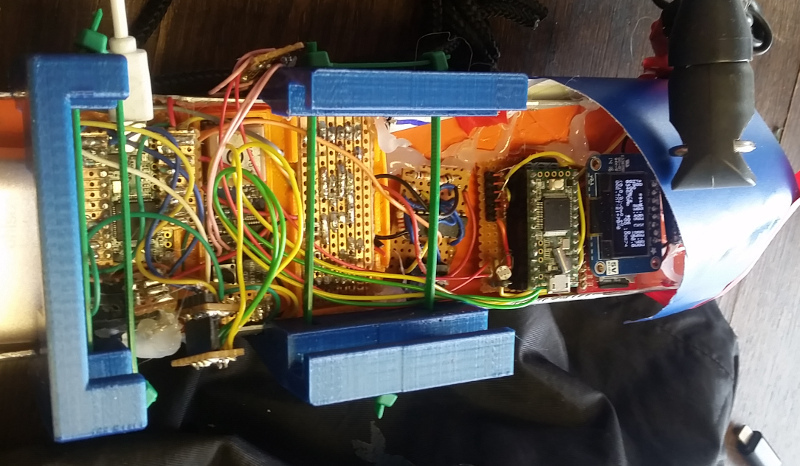 If the pilot starts to turn (or already is in a turn) the accelerometer feels not only the lift force, but the response of the sensor is affected by the angular velocity. This can false the variometer’s reliability, in terms of climb rate. Therefore, to compensate, it becomes necessary to perform a series of calculations. But, in turn, this operation increases the electronic noise. As consequence, the variometer becomes less precise, and the unit is compelled to use some more bits to sample the data. Luckily I didn’t even try this. With a lot of research it might be possible to invent an entirely new instrument, one that perhaps registered changes in horizontal airflow. I’m also pleased to see all their notes on their website about electronic noise wrecking the precision of these sensors, because that’s exactly what I found early on. Both LK8000 and XCSoar have implemented CProbe NMEA statement parsers. I’m a big fan of long lines to perform geometrical calculations, rather than line-breaking them up in short chunks so they become unreadable. You’ve also got the different ideas for when you have four variables and you can call them q, q, q, q or q0, q1, q2, q3. And finally, the second code snippet realizes that angles should just be a number in straightforward Degrees (never evil Radians), and not encapsulated into a complicated 500 line C++ class. I have written a vast amounts of this sort of code for running machine tools, so I do like to see the existence of contrasting styles where at least one side agrees with me. Most of the time I lost my arguments, even though I was right. Radians are the purest evil and should never be in any program concerned with geometry rather than differential calculus. Nevertheless, I’m going to start trying to hack the XCSoar code because it builds slightly more quickly. It’ll probably be a mistake.